Events are an active part of your organization’s ministry. 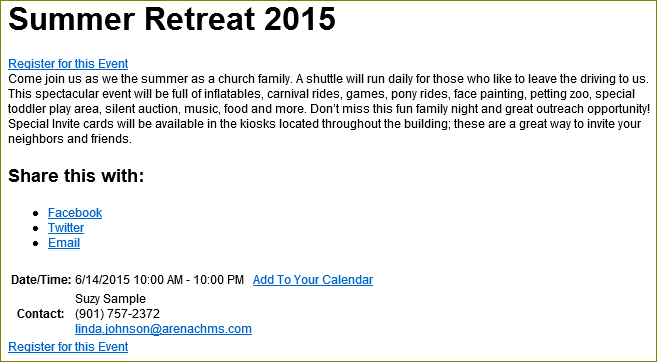 These events can be anything from VBS to a Women’s Conference. The key to the success of these events and the resulting growth and development of your membership is event promotion, a function easily accomplished on your Arena-managed website. To implement the default on-line promotions and events on your website, you need ten pages. These pages are already in place. You next step is to review and customize these pages and modules to fit your organization. While you can use Events without a payment gateway for events that do not have any associated fees, you need a payment gateway in order process payments. Arena has four integrated payment gateway providers. Start the Event Email agent. If using the optional Facilities Management Resource, start the Update Resource Events agent. Customize the Event Refund and Event Registration Notification System Emails. Customize the Event Registration Type, Event Tier Level (if using), Event Type, and Topic Area Lookups. Advise your contributors to not click the back button in the browser while completing the contribution. This action could result in duplicate payments. Events page – This page is your user’s primary access point to events. It displays a listing of your current events and allows users to navigate to the details and registration areas for each event. This page does not require a secure login so you can place it directly under your Home page and should be visible in navigation. There are several module options for this page such as the week view module and several promotion modules. Each module has modules settings that you need to review and customize. Most modules have required module settings such as the Promotion and Event Details pages so that event registrants can click the available link and be redirected to the details page of the promotion or event. This page requires the Event Week View module with your Event Details page selected. This module includes optional settings to filter by Campus, customize the number of days to show, filter by Topic Area Lookup and an optional Lookup filter. If the goal is to have multiple calendars, you can add another page, changing the Topic Areas. Promotion Details page – The promotion detail page displays when a user selects a promotion that does not tie to an event tag. Its largest difference from the Event Details page is that a user cannot register for non-event-promotions, as they can for event promotions. This page should be a child page of your Events page and should be set to not display in navigation. This page requires the Promotion Detail Display module and has no required settings. Event Details page – After a user selects an event, this page displays. 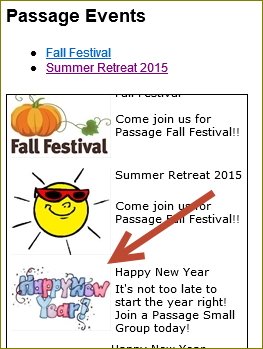 The page should be a child page of your Events page and should be set to not display in navigation. This page requires the Event Details module with Registration page set to Event Registration Page 1 in order for the user to begin the registration process. Event Registration pages – The default five Event Registration Pages are forms that a user needs to fill out when they register for an event online. They are very similar in their setup and should all be located as child pages of your Event Details page and set to not display in navigation. Each module is located on the page of the same name (e.g. 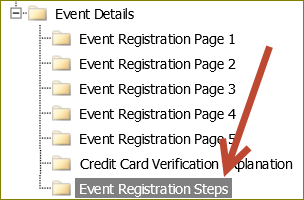 the Event Registrations – Page 1 module is located on the Event Registrations Page 1 page). For events not using a login in page, you have the option to use anonymous registration, where first and last name are required. •Event Registration Page 1 – This page displays the description and instructions from the Event Tag. This module requires you to select a Login page, Event Registration Page 2, and Event Registration Page 3. •Event Registration Page 2 – This module requires you to select an Event Registration Page 1 and an Event Registration Page 3. •Event Registration Page 3 – This page displays the registration form. The module for this page requires you to select an Event Registration Page 1, Event Registration Page 2, and Event Registration Page 4. To remove the Family Member option, remove text from the Family Member Description module setting on this default page and module. •Event Registration Page 4 – This page displays the Registration Summary prior to processing any payments. This module requires you to select your Event Registration Page 1, Event Registration Page 3, Event Registration Page 5, and a default Member Status value for members who add themselves to your database from Event Registration. Optionally you can also select the Credit Card Verification Explanation page below as the CIN page. Consider setting the Membership Status to a unique membership status for this module to work in conjunction with your duplicate record strategy. You can then create a List and use the Event Tag and unique Membership Status as criteria. •Event Registration Page 5 – This module only requires you to select an Event Registration Page. Credit Card Verification Explanation page – When a registrant pays any registration fees using a credit card, they need to enter the Card Identification Number (or CIN) printed on the back of their card. The specific location of this value and its purpose can be confusing to some users, so you can use this page to clarify any questions they might have about their CIN. This page should be a child page of your Event Details page and should be set to not display in navigation. This page requires the Advanced HTML Text module. You need to set this up with your own information. We suggest including an image showing the specific area of the back of a credit card, as commonly seen on online shopping sites. Confirm that the “Register Steps” module is available. From the Administration menu, click the Pages option located under the WEBSITE heading. 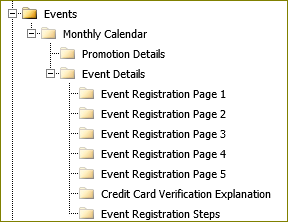 Create a new page under your Event Details page (example page title: “Event Registration”). Add the Register Steps module to the new page. On the Event Details module, change the Registration page module setting to point to your newly created page from step 3.